How To Treat A Dog Hot Spot – This Home Remedy For Dog Hot Spots & Bug Bites Worked For Us! My dog recently got a really bad bug bite on his leg. It irritated him so much that he immediately started itching and scratching (and licking) it constantly. Later that same day, the spot on his leg became raw (and hairless). Similar to a hot spot, it needed to be kept dry and covered for a few days in order to heal properly. Otherwise, my dog would’ve just kept licking it all the time and it wouldn’t ever have a chance to fully heal. Must read: Why Does My Dog Lick And Chew His Feet? Fortunately, I learned a few things from the veterinarian who treated my other dog for a hot spot several years ago. 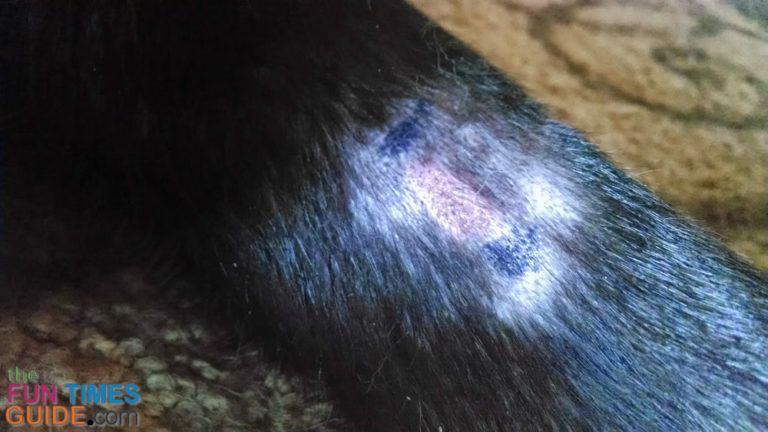 I ended up treating my dog’s bug bite the exact same way that the vet treats hotspots on dogs. Following is the dog hot spot home remedy that I used. My dog’s leg was completely back to normal in just under a week. Cleanse the area using witch hazel on a cotton ball, daily. Add a thin coating of Neosporin on the spot, daily. 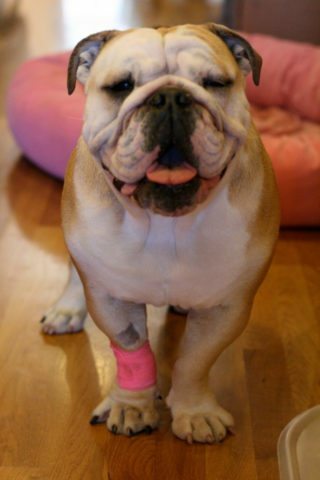 Give a little bit of liquid Benadryl mixed in with some wet dog food a couple times a day for 2 days. 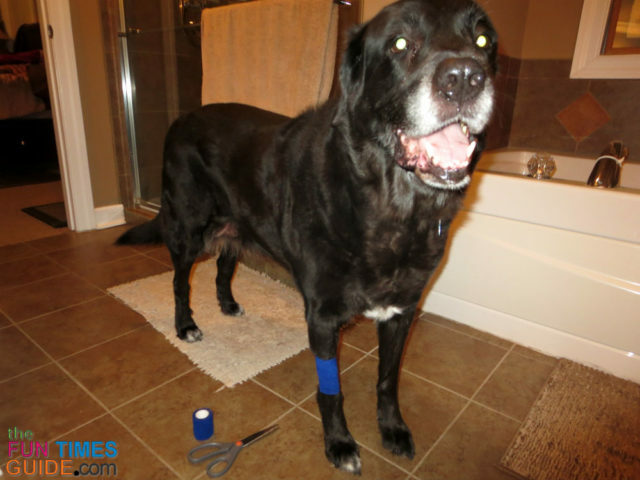 Wrap a 12-inch strip of self-adhesive bandage over the spot, so the dog can’t directly lick the spot. This alone helped to stop the itching and bring my dog a little bit of relief. Cut a 12- to 14-inch strip of the self-adhesive bandage and wrap it all the way around the spot — not too loose and not too tight. The self-adhesive bandage sticks to itself really well, but it’s easy to re-position it if you need to. Try to make sure the final end doesn’t wind up on the top part of your dog’s leg — where he could easily grab it and loosen the wrap. Finally, use your hand to cup the wrap around his leg several times to make sure that it’s super secure. 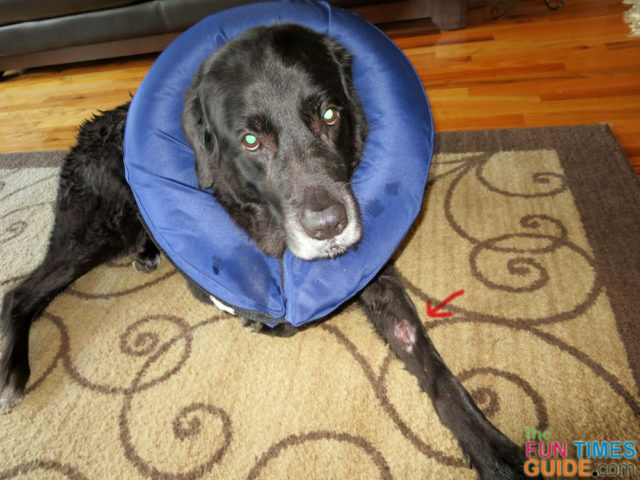 After bandage wrapping the spot, you’re probably going to need an e-collar for a few days — just to keep your dog from licking around the bandage (or removing it altogether). While the meds and the bandage lessened the itch, I noticed right away that it was still hard for him to take his mind off of the spot that was front-and-center on his leg. Every time he laid down to rest, that spot was right there in front of his face — so he licked at it. As a result, the gauze bandage usually got dislodged in the process. It was time for a dog e-collar. We used an inflatable e-collar for the first time ever. It worked great!